Shamley Green is a picturesque village of over 600 dwellings in the civil Parish of Wonersh. It is situated about 5 miles south of Guildford, on B2128 between the villages of Wonersh and Cranleigh. It is bordered on the east by Blackheath and in the west by the Cranleigh Water branch of the river Wey, and is in the Surrey Hills area of outstanding natural beauty. There are two areas of public open space in the village, including one on which cricket has been played for over 160 years, and a number of commons. The cricket green is the site for the annual village fete and the green is also used for the occasional fair during the summer. Although the Parish Council owns a minority of the common land in the village it has adopted a Shamley Green Commons Enhancement and Management Plan to guide the stewardship of this greatly valued local amenity. Protecting our rural heritage is a major commitment of the Parish Council and Waverley Borough Council. We hope the following guidance on access tracks across the registered common land will be helpful. The village has two pubs, the Red Lion and the Bricklayers Arms, as well as being well served by the village stores with a post office, a health and beauty shop and a cook shop. The village has a pre-school and two schools – Shamley Green Montessori Pre-School, Wonersh and Shamley Green CoE Primary School and the independent Longacre School. Shamley Green has a number of thriving social organisations including the Village Association, History Society and Gardening Club, to name but a few. 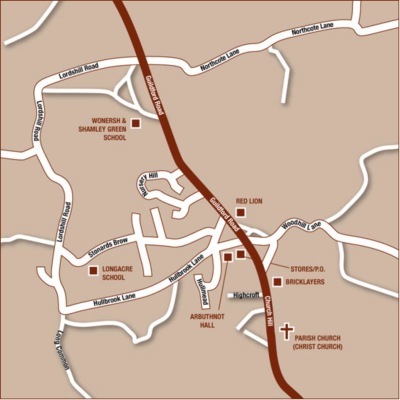 Details of all the organisations in the village can be found through the links on this website. The Arbuthnot Hall by the cricket green serves as a centre for many of the local activities, including the many AGMs, sporting fixtures such as badminton and regular performances under the auspices of SHADES, the local amateur dramatics group. It also doubles as the pavilion during cricket home fixtures.